P’nut butter + bread & butter pickles = terrific sandwich. I’ve been eating them since I was a kid. Salt & vinegar chips crossed my mind as I read the title. I’ve made chips & chocolate cookies since long ago, but it has been since forever that I made them so thanks for the reminder. Love the sound of adding chips to cookies! This sounds too good to be true…I need these in my life! I love this! I love adding salted pretzels to my choco cookies but these just take it to another level! Yum! Pingback: Happy little Sunday things. - Leaf Parade. This looks amazing!! I am so into sweet and salty. My absolute favorite! You don’t need to be pregnant to crave these cookies! 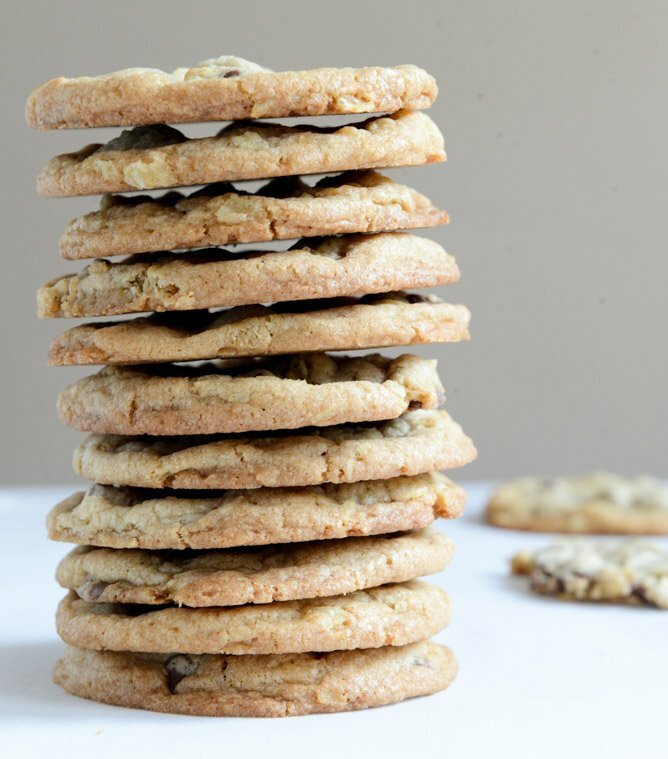 Love the idea of a chewy cookie with potato chips, so yummy! I am pregnant and these sounded great to me! I had a serious internal debate: regular vs. salt & vinegar chips and the regular won out. Sadly, they just weren’t salty enough for me! Salt & vinegar gets into the next batch…. Can we just melt the butter in the microwave? A little too dry and crisp for my taste. How can I make this more moist and chewy? I would totally eat all of those. That whole stack. In my FACE. Wow! 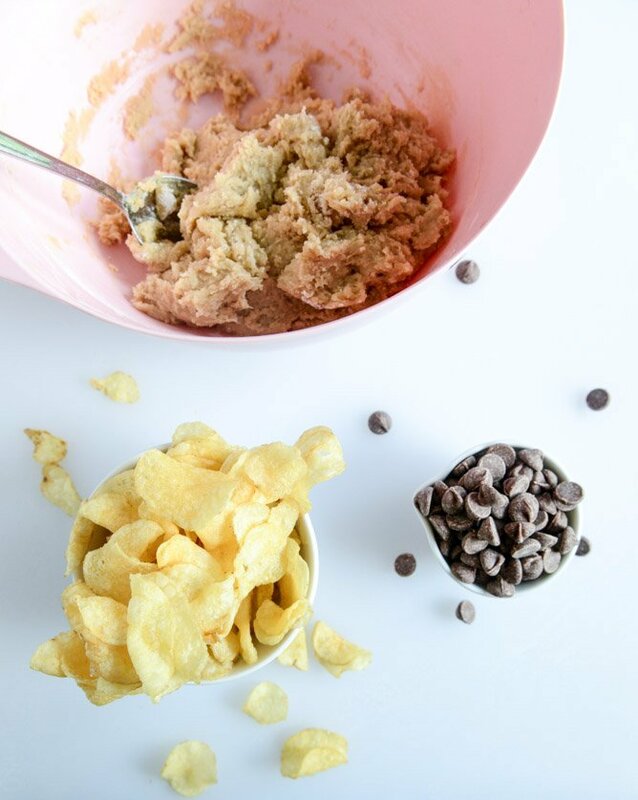 Never thought of combining chocolate and potato chips together, but can’t wait to try this! Thanks for sharing! hmm, i thought i saw these on smitten kitchen as well as somewhere else? i love your blog, but any credit to those who posted exact same ideas and recipes before? Recipes are always tricky when it comes to ownership and copyright. Most recipes are going to be similar (especially when baking) because of the chemistry behind it. Simply put, most recipes are adapted, be it the measurements or the actual ingredients. I feel that as long as this recipe was not word for word anyone else’s recipe then no credit needed. 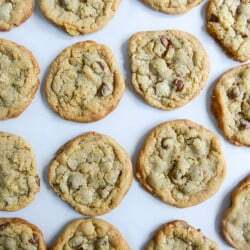 if we had to give credit for every recipe we have come across (or have not come across), that is like saying we need to credit every chocolate chip cookie recipe to the inventor of chocolate chip cookies. I don’t believe anyone claimed this recipe for chocolate potato chip cookies to be a ground breaking original idea, or that no one has ever done them before. (I have seen these done by many people) I think these recipes are meant to share an experience, an idea, and inspire people to try something that the poster thought was an amazing treat. Okay. totally making these. Thinking about putting those new Cappuccino Lays in them. Or just regular old salty crunchy kettle chips. ER my gawd. Chips and chocolate chip cookies? That’s insane and genius at the same time. I’m sure if my family sees my baking these two ingredients together they’re gonna think I’m crazy. I am so craving these cookies. This is the PERFECT snack for my fiance’s bachelor party this weekend!!! I made these cookies as a birthday present and they were amazing! The texture was unique, but delicious nonetheless. While my cookies didn’t spread out like these ones; they tasted good. I would recommend wearing gloves while making this as kettle chip shards would prick my hand and it was tender by the end. Hi, just baked a batch of this earlier today, i have to agree with Megan on the cookies not spreading like yours, mine was thicker than picture. I have a few concerns that maybe you can help. My chips were soft inside the cookies but the ones on the surface were still crispy. is that normal? and i am putting more salt next time too as it turns out my Lays chips were not salty enough to counter the sweetness of the chocolate chips (i used the mini chips and am definitely going back to normal size chocolate chips or even choc chunks next time). Is it possible to use dry cookie mix and have it still taste good? Just made these! They’re super good!!! ran out of chocolate chips, so i added peanut butter chips also. Such a good addition! As I love cookies I will have to make this recipe hahaha. Congratulations on your work, I always follow your blog.